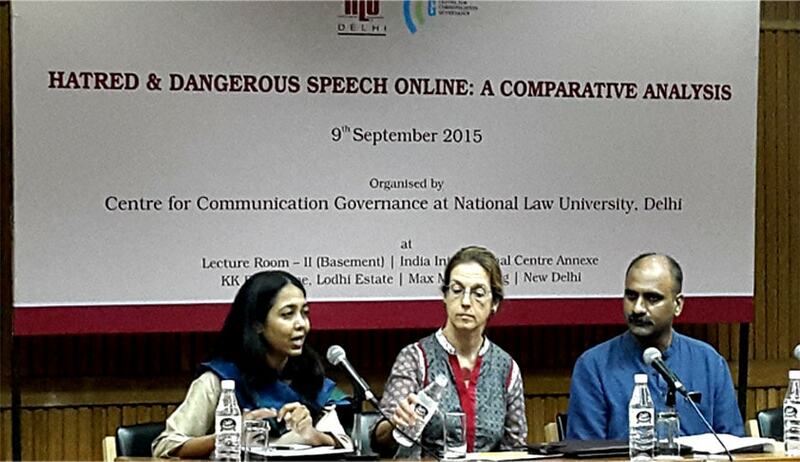 The Centre for Communication Governance at National Law University, Delhi organized a panel discussion on “Hatred and Dangerous Speech Online: A Comparative Analysis” on 9th September 2015 at India International Centre. The panelists included Professor Susan Benesch, Faculty Associate at the Berkman Center for Internet and Society at Harvard University, Mr. Manoj Mitta, Senior Journalist and Author and Ms. Chinmayi Arun, Research Director at the Centre and Assistant Professor of Law. This was in light of the fact that online media of various kinds, from Whatsapp to Facebook, have been in the news with increasing frequency in the context of hate speech and inflammatory speech. The North East Exodus, the Muzaffarnagar riots, the Pune mob-lynching have all been attributed to online hate speech. Dealing with online hate speech has been complicated because of the state of our laws that deal with offline hate speech. These laws have been criticized for being simultaneously inadequate and chilling freedom of expression. The Supreme Court of India has taken note of this crisis of law in the context of hate speech. It is currently hearing Dr. Subramanian Swamy’s petition challenging over half a dozen provisions dealing with hate speech under the Indian Penal Code. The petition argues that these provisions are beyond the contours of reasonable restrictions on free expression as envisioned by Article 19(2) of the Constitution. Irrespective of the outcome, the judgment will have a very significant impact on the freedom of speech and expression in India. During his talk Mr. Mitta outlined the instances of speeches leading up to large-scale violence in India, giving narratives of how the speeches were instrumental in building public sentiments against minority communities and encouraged extreme actions on behalf of the audience, thus playing a role in condoning the violence that was to follow. Professor Benesch spoke about the frame work she developed to study hate speech in different contexts. Her work separates hate speech from what she refers to as ‘dangerous speech’. Professor Benesch isolates speech that has an inflammatory effect on a group, and that is often the precursor to violent acts carried out by the said group. The next step is to identify this ‘dangerous speech’ to see if it can be prevented or neutralized somehow. According to her there are various factors at play which influence how dangerous an instance of speech might be in terms of causing violence. These factors included the identity of the speaker, the nature of the audience, the socio-historical context in which the speech is given, as well as other factors such as the medium through which the speech is transmitted. This last factor found greater relevance in the discussion that followed as the event also focused on speech in new media, specifically the internet. Ms. Arun initiated the discussion on how hate speech regulation in India currently suffers from a simplistic understanding of the issue itself and how to regulate the same. Audience inputs were then taken regarding their experiences with the subject, and it was highlighted how there needs to be more insight on hate speech laws in India beyond the usual modus operandi of arrests and site-blocking.